More Star Wars Hints and Clues Than You Can Shake A Lightsaber At! Anthony Mackie teases the political bent of Civil War. Is Hugh Jackman part of reshoots for Deadpool? Melissa Benoist talks about Superman appearing on Supergirl. Plus, Arrow teases more mysteries, and what’s to come on The Flash, iZombie, Doctor Who and The Walking Dead. To me, my Spoilers! 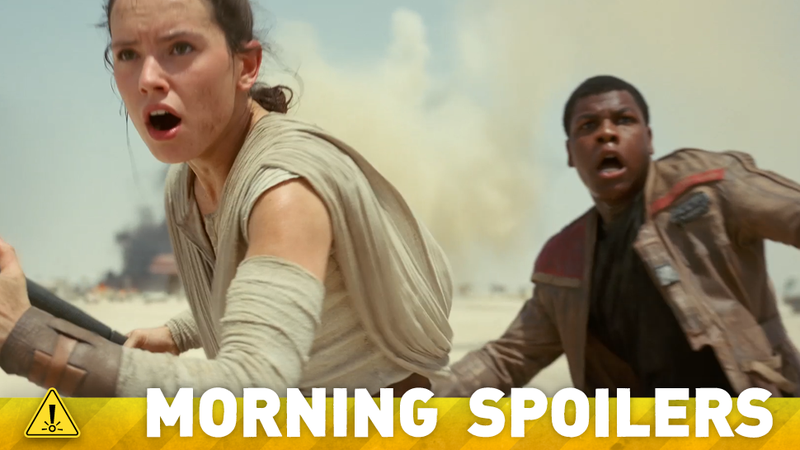 Over the past week or so, rumors cropping up from several sources—from British newspapers The Mirror and the Daily Mail, to Star Wars rumor house du jour Making Star Wars—claiming that BB-8 is being referred to internally by Lucasfilm as not just a huge primary character in the movie... but also a female character, gendered as such to appeal to female Star Wars fans. Usually the appearance of such a rumor from multiple difference sources would lend credence to the material, but all marketing and merchandise for the film so far have labelled BB-8 as male or gender-neutral, like many Star Wars droids (Kathleen Kennedy referes to BB-8 as “he”in yesterday’s videos for the new Star Wars Coding project Hour of Code). It seems like there may have been some crossed wires at some point. A rumor from Jedi News posits that Gina Rodriguez has been cast as one of the rumored lead female characters in the movie. Rodriguez was allegedly on a shortlist that included Tatiana Maslany, Olivia Cooke, and Gugu Mbatha-Raw, but Jedi News’ speculation simply comes from the fact that the actress was recently followed on Twitter by John Boyega and Rian Johnson, so treat this is as highly tenuous for now. Very much so. I feel like “Captain America” is all about the ups and downs of the society that we live in today. It’s really genius how Marvel can take fictional characters — superheroes at that — and then take the politics of today and wrap them all together and make you believe and buy into it. A goofy video interview between MTV and Bradley Cooper has had several news sites claiming that the actor has revealed the “major spoiler” that Thanos will be Star-Lord’s father. You can see the video below, but director James Gunn hastily tweeted in response saying that Cooper has only just received a draft of the film’s script, so he knows very little about the actual story yet. Hugh Jackman has shared a picture of Ryan Reynolds impersonating him, taken from the set of the film’s reshoots, taking place in Canada over the last week—leading to speculation that Jackman may have been there to film a cameo appearance as Wolverine. Here’s the first teaser poster for the movie, ahead of a “First Look” at the film on Ellen later today. We’re definitely toying with that, and when and if we do decide to do that, it will reveal even more pertinent information about not who’s going to be in the grave but certainly where our characters are when that [death] happens. He’s always there on the outskirts and pops in and out in fun, creative ways. But this is definitely Supergirl’s story. I really didn’t think about playing the lead at the beginning. I started out as the executive producer developing a project for AMC. That was exciting on its own. And then when we went through the audition process it became clear that I was going to be playing the lead role because it didn’t start off that way. In my mind I thought we would get someone in their late 20s or early 30s because physically its a very demanding role. Linda and Barry stage their fight to trap Zoom in a clip from “Enter Zoom”. Liv uses her new brain to make a hefty bet in a new clip from “Max Wager”.